The Dowty Club held their annual award evening recently in the main Clubhouse at Dowty Staverton. This years theme was an American supper evening with some 75 Players, Parents and friends in attendance. There were also thank you gifts to the Club's Coaches, Don Quinn, Dean Douglas, Brad Salter, Dave Williams, Gary Foley, and Bryan Butler. The Club also presented thank you gifts to Pete & Chris Salter. On Friday the 9th December 2011 a combined grading was held at Newent Judo Club where players from both Apollo and Newent were tested for their grades. The following were the results of the grading, well done to all who took part. The County held its 3rd Gloucestershire Junior Open on November 5th 2011. The event was again held at the Newent Leisure Centre, which is the home of the Newent Judo Club, was extremely well supported by both local Clubs, and from various parts of the Country. The medals were well spread with the local Clubs winning their fair share, and Gloucestershire used the event as a form of selection for the West of England Junior event which is due to happen in January. Results here. Pete Douglas sent in this report - B.S.J.C were on top form once again all of our England cadet Squad players were away. So the spotlight was on the younger ones & they didn't fail to impress from our 2 light weights 23k Alfie & 25k Jess to 66k Louis (the cruiser) Arsac. Golds went to Joe A, Louis A, Jack R, Hannah P, Elisha, Eli B and Jess R. Silvers went to Lissa B, Megan R, Tasha O, Mark A, Kiera and Ellie Y. Bronzes went to Harry T, Toby A, James W and Alfie L. Jambo and Brandon just missed out on the medals. Fantastic especially as 7 of our players were only 8 years of age fighting in the under 12 category. Elaine O'Connell sent in this report - Newent Judo Club entered 6 players and returned home with 4 Silvers, a bronze and a fifth place. Well done to Izzy, Kam, Evan, Tarran, Brodie and Carrie. 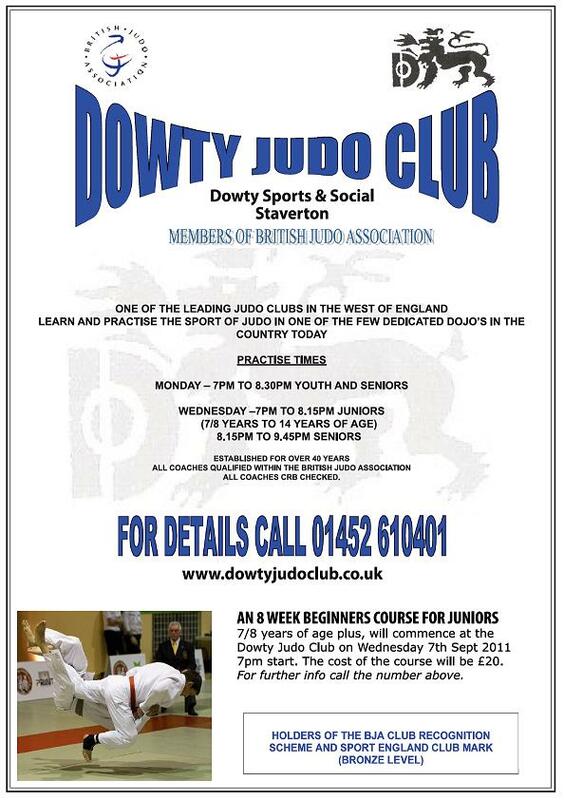 Dowty Judo Club have decided to run an 8 week beginners course in judo. The first week will be Wednesday the 7th September 2011. This course will be suitable for boys and girls aged 7 to 14 years old. The cost is £20 for the course and Junior sessions are on Wednesdays from 7.00pm - 8.15pm. For more information ring Pete Salter on 01452 610401. B.S.J.C. brought home 3 Golds, 2 Silvers and 5 Bronze Medals from 2 international events this weekend. 23 players fought, 21 in France and 2 at the London international. They fought players from France, Russia, Spain, Italy, Germany, Senegal, Holland, Belgium and Turkey. Our players did us and England proud. They were gracious in defeat and victory. After these events I realize how similar we at B.S.J.C are to our European neighbours. Pete miles and Jordan Knight will be fighting for GB in Venray Holland later this month. On Monday the 16th May 2011 a combined grading was held at Apollo Judo Club where players from both Apollo and Newent were tested for their grades. The Gloucestershire committee have recently debated the spectator behavior at judo events issue and considered if our own County have in fact any case to answer ourselves, and concluded that whilst it is by no means a major issue within the County, it would do us no harm at all to re-evaluate our approach in trying to ensure that we do our bit to maintain the principles which underpins our Sport, particularly where Junior Players are concerned. I think we could all agree that participating in the competitive arena of our Sport can be intimidating in itself without the added pressure of spectator behaviour which, at all times whilst being understandably supportive of their own Players, should never be reflected as a negative effect on the opposing Players, particularly where young Players are concerned. We have traditional standards within our Sport, and there are some spectator behaviours within other Sports, such as booing, chanting, stamping etc which are creeping into our Sport, and just do not fit our code of moral conduct and ethics. As I say then, it does none of us any harm at all, to periodically stand back, and reflect as to our duty to respect not only our Sport and the BJA, but also our opponents, particularly those of a younger age. Bradley Stoke Judo club success at The Peter Murphy Junior (Western Area Closed) - 8th May - Kingsbridge, Devon. What a day on the 8th May at the West of England closed competition where Bradley Stoke Judo Club entered 18 players and won 16 medals, a ridiculous success rate. In the under 12 Championships most of the B.S.J.C players were only 8 or 9 years old. In the u27kg Harry Tetlow was in stunning form, only one judo session in 2 months due to injury and he came back with a vengeance, only losing to Joe Andrews also of B.S.J.C in the final, Joe has now won at this event three years running. Jack Reeves in the u38kg and Eli Britton in the u42kg, some would say are B.S.J.C superstars winning their Gold medals in style, they looked so much in control. In the u25kg Jess Reeves is following in her brothers footsteps winning a Silver medal for the first time at this event. Megan Robinson fought up a weight in the u44kg group and I was worried for her as they looked so big, she came close to being in the final but came away with a well deserved Bronze. First time for Joshua Lockett in the u34kg at this high profile event and he came away with a Bronze medal beating one of the favourites. James Wishart also fought in the u34kg he was the youngest and the lightest in the group and fought courageously in his fights, I'm sure he will learn from this experience. In the under 16 Championships B.S.J.C had 3 players just 12 years of age fighting. Isaac Mathews was in a pool of 3 with 2 GB players who eventually fought the final so he was very unlucky. Ellie Young in the u44kg and Hannah Pitt in the u63kg fared much better winning Bronze medals in style. Hannah was stopped from winning gold or silver by her own team mate Lissa Britton who is Champion again in the u63kg group, it's becoming a habit for Lissa. Steph Walker in the u44kg showed all of us why she is a GB player when it gets close she will keep fighting to the end, another Champion. Toby Attwood in the u34kg won a Silver medal, not what he wanted but I think he learnt an important lesson about his judo. Ollie Millard in the u50kg was on his game, he has had so many near misses in his judo career and today his hard work finally paid off, he won a superb Silver medal. Ben Papuca won a Bronze medal in the u60kg group only losing to the eventual Champion who was Japanese, not bad considering his training has been sparse over the last few months. And finally to the under 55kg group it was just like watching a film, Ben Attwood on one side and James Hayes on the other. Fighting his way to the final Ben didn't put a foot wrong dispatching all of his opponents in quick succession. James was doing the same until the semifinal, where it nearly all went wrong for him, even though he was looking good he got penalised 3 times, but with just 20 seconds to go he threw with a stunning Te guruma, a massive IPPON. The final was a B.S.J.C affair James the young challenger couldn't cope with the Attwood seonagi, BUT A GREAT RESULT FOR B.S.J.C. 6 CHAMPIONS, 5 SILVERS, 5 BRONZES AMAZINNNNGGGGG. See the team picture on the gallery. Four members of the Dowty Judo Club travelled to High Wycombe recently for the High Wycombe Senior Masters competition. The Dowty Club has quite a good record at this event, which attracts a good quality entry, and this year was no exception as all four entries from the Club achieved a podium finish, two Silvers and two Bronzes. Both Steve Organ and Dean Douglas, competing at -81 and -90 kgs respectively, came close to winning their respective categories, Dean scored three good wins before missing out on his fourth contest which was in effect the final, and Steve got to the same position before missing out in the final, but a good first performance for him after a long term injury. Brad Salter, who only gained his place in the National Masters Squad last year took a Bronze in a very competitive -81 kgs category, and Dave George at -90 kgs, also made a successful comeback after a long term injury with a Bronze Medal finish. All four Players will now be looking to cement their places in the National Squad during the remainder of the year. See the team picture on the gallery. B.S.J.C will be travelling to France on June 2nd to compete in the Grisolles International. 24 countries will be taking part and the club have 19 players competing from the ages from 8 to 17. This will be a fantastic opportunity for the B.S.J.C club players to meet and compete with players from all over the world. Highly successful Bradley Stoke Judo club (BSJC) has had an outstanding weekend of success at the British Schools Judo Championships in Sheffield. The hugely competitive national event saw over 450 school pupils aged 10-18 compete in their age and weight categories. The club fielded 12 players and were astounded to win 8 medals. 5 Golds and 3 Bronzes. British Schools Judo Championship Gold Medals were won by brothers, Ben and Toby Attwood, Elissa Britton, Hannah Pitt and Tasha Okoye. Bronze medals were won by Jack Reeves, Kelly Wilson and Eli Britton. Head Coach Peter Douglas was bursting with pride for his players but was quick to point out that their success was due to a combination of a number of factors - dedicated training, exceptional club teamwork, persistent personal application and enthusiastic vocal support from the army of friends and family supporters. "Every single BSJC competitor gave it their all. There is plenty more to come from everyone especially those that did really well but did not win a medal on this occasion." The family friendly club is well on it way to challenging last years record breaking medal haul. Earlier on in the year Peter Douglas won gold at the Eurometropole Masters Championships in Lille, France and Ben Papuca won gold at the Headmaster conference for independent schools. The club is now preparing to take a team of nearly 20 youngsters to compete in the Tournoi International de Grisolles in France in June. There was a brilliant squad session at Marling School sports hall today as reported on by Izzy Butler. On Saturday 5th March 2011 at Marling sports centre in Stroud a Gloucestershire junior squad session took place from 10:30am until 12pm. The session was taken by Bryan Butler, the junior squad coach. At the squad session there were representatives from four different clubs in Gloucestershire, Bradley Stoke, Stroud, Dowty and Newent. After limbering up with some fun exercises to get the blood pumping, we did some strength exercises using the belt and some general fitness and technique work. The class was split in to two different groups based on size for the randori so that we could have a fight then rest. We began the tachiwaza randori with everyone mixing with other people from other clubs giving us new experiences and ways of fighting that we would not have unless we went to competitions. Each randori fight lasted 2 minutes and was challenging but enjoyable at the same time. After tachiwaza randori we moved on to newaza randori which was also challenging, we did a few fights of newaza randori before doing newaza drills to help with newaza randori. To end the session we did some Pilates a leg exercise which strengthens the leg muscles. The whole session was fun and enjoyable I was able to interact with other judo players from other clubs. Even though the session was tough it was exhilarating and fun. I can't wait for the next Gloucestershire junior squad session!! Jonathan Lockey (Noddy) and Ieuan Walters completed their line-ups for their BJA 1st Dan grade at a recent BJA Grading up at Walsall. Apart from their significant achievement in defeating their respective line-ups, it should also be noted that both players are just 17 years of age. A Squad of the Counties vets travelled to Lille in France for the Eurometropole Masters event. Amongst them was Chris Andrews from Dowty, who took Gold in his category. See picture of Chris on the gallery. Access a copy of Pete's County Update for February 2011 here.